Veg Cutlet or Vegetable Cutlet is an easy and delicious Indian snack made from mashed potatoes and other veggies, perfect to have along with a cup of tea in the evening. Here I used Veeba garlic chilli spread This can be used in any dish. We don’t need to add any extra garlic cloves or chilli powder. To a bowl add mashed boiled potatoes. Add chopped carrots, chopped beans, diced onions, boiled peas, and chopped beetroot. Any vegetables could be used. Add coriander leaves, mint leaves, 2 chopped green chillies, 1 teaspoon coriander seeds powder, 1/2 teaspoon chat masala, and 1 1/2 teaspoon salt, 2 tablespoons corn flour for binding, 2 teaspoon garlic chilli spread and dip. This spread and dip can be used in any dish. This spread will enhance the taste of the dish. In a different bowl, mix 2 to 3 tablespoons of corn flour in 1/2 cup water. Put this prepared corn flour mix beside a plate of bread crumbs. Let’s make cutlets now. Spread oil or water on your palms. Now take a small amount of prepared cutlet mix, mould it in to desired shape. Dip it in corn flour & roll it in the bread crumbs. Deep fry or shallow fry the pieces. Heat 3 tablespoons of oil in pan Fry the cutlets one by one on medium flame. Flip after one side turns brown and turn the flame to low. Fry till both sides turn brown Serve it with VEEBA Mayonnaise. The reason I chose this is because of its quality ingredients and taste. 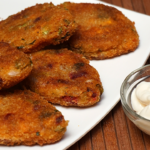 “Veg Cutlet or Vegetable Cutlet”, a quick, easy and delicious Indian snack. Samosas, Puff and Cutlet are the top 3 of my favorite Indian snacks and I would love to have them anytime and more so with my evening cup of tea. Veg Cutlet or Vegetable Cutlet is an easy and delicious Indian snack made from mashed potatoes and other veggies, perfect to have along with a cup of tea in the evening.